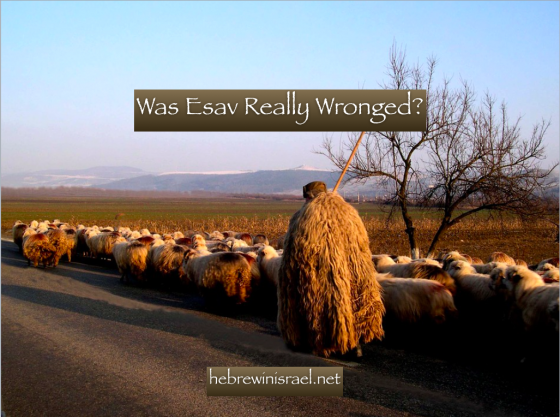 The following article asks the question of what were the legal grounds in Bereshit 27:1-28:5 for the removal of the blessings from Esav to Ya’aqov. The story of Ya’aqov taking away the blessing of the first-born from Esav seems to be an immoral act on the part of Ya’aqov. Being a man of the tents, one would assume Ya’aqov would have had a much more moral path of life, and would have not agreed to his mother’s command. However, when looking into the practices of inheritance, we actually find that what was done was in complete compliance with law and custom. To understand the issue we first have to look at what Ya’aqov actually “stole”. The blessing given to him was in truth the only thing which was taken, while Esav actually preserved his material rights. The taking of the blessings was in truth the removal of Esav by title, but not the physical inheritance. More so, Ya’aqov lost any physical property which his father had, and by that Esav actually received compensation for the loss of the blessing. To answer this I had to speak with Dr. Tzphrira Ben-Baraq who happened to walk into one of the classes I attend, and gave me her book on inheriting in the ancient world. In her book she discusses the issues of the daughters of Tzlophchad, and why they requested that they will be the ones who will inherit their father’s allotted land. This request was much more than just land, and was about their names being placed on the property. Now that we know this, we can understand better what happened with Rivqah and Ya’aqov. The issue was not property but name. Esav did not have the character and reputation that would fit such a family. This reputation was so important that Avraham sent his servant to bring Rivqah all the way to Canaan. Rivqah knew very well what kind of personal sacrifice was needed to upkeep the path which her father-in-law went through. To place Esav’s name on this “deed” would be a dishonourable act, and shame the family. Now one must also ask how Rivqah was authorised to do what she did? In ancient laws there was a displacement rule that when a first-born is not worthy of being the head of the family, he would be replaced with one who is. In most cases the first-born not only takes the charge on property, but becomes the new patriarch of the family. However, if the first-born is unworthy, his next in line, or someone else, will be named head inheritor. Rivqah was the head matriarch, and unlike what many think, mothers of her status had a lot of power. In the case of Rivqah we also see a very active person, who sometimes compensates for her husband’s lack of action. Hence we can speculate that Rivqah was actually “co-regent” in the family, and her word had weight. One can attribute Yitzchaq’s response to what seems to be the passive nature of Yitzchaq, but it is also very possible that he knew that what was done, and that it was all legal and authoritative due to the wishes of his wife. This possibility demonstrates the above argument that Rivqah had a lot of weight in the family, and her words would be respected by her husband as law. Yitzchaq also probably realised something which is symbolised by his eyes being “heavy”. The given description of Yitzhaq as being legally blind goes much more beyond his physical state. He was also mentally blind due to his weakness, a condition which demanded a very strong wife. Rivqah probably functioned as his consultant in many areas, and out of a wish to give the family a strong leader, he preferred Esav. Rivqah knew that this would be a bad choice, but also knew that Ya’aqov was indeed weak. Hence sending Ya’aqov to Lavan was a way to strengthen him and shape him into a leader. Yitzchaq supports this idea, which indicates that he probably understood by this point the mistake he made, and Rivqah convinced him of this plan. Another possibility is that Yitzchaq had finally realised what Rivqah understood from the beginning before the sons were even born. This point is evident from the last words of the second blessing where Yitzchaq incorporates the land promised of Avraham. By doing this he officially places the rights and authority of the first-born on Ya’aqov. Interesting article! It is clear that both Sara and Rivka had an (unusual) authority and influence over their husbands. I would add that Esav demonstrated startling lack of appreciation for the privilege of being firstborn when he sold it for a bowl of soup! That particular anecdote provided objective justification for the subsequent actions of his mother and brother. I believe the problem here is the way things were done. Rebeca knew the blessing was meant to Jacob. She should have talked to Isaac about this instead of deceiving him.